Growing up I never really got the obsession with Switzerland that movies and TV seemed to have. Now having been there twice I can completely understand the obsession. Lucerne in Switzerland is hand on my heart the most stunning place I have ever visited. So come along with me as we spend 24 wintery hours in Lucerne. 4:00PM: On arrival it’s time to check in to Hotel De La Paix. It’s away from the tourist area of Lucerne but is a lovely hotel - very cozy and if you get lucky you might get a room with a balcony. 5:00 PM: Once you’re all settled in it’s time to head out to explore the town. You’re going to be heading towards Lake Lucerne for an afternoon stroll along the promenade. Don’t worry too much about what path to follow - if anything getting a little lost is a good thing - you never know what you might find. The picture below was taken when we stumbled on a lookout above a school car park. This is part of the magic of Lucerne. When you get to the lake it’s time to wander and amaze at how beautiful Lucerne is. 7:00 PM: Now that’s your thoroughly chilled walking along to the lake it’s dinner time. Dinner is at Shamrock Pub. It’s the perfect place for dinner on a wintery night. It’s nothing fancy but the beer is affordable (I recommend the Feldschloschsen beer) and the food is hearty. What really makes this place a great one is the atmosphere. It’s cozy, cheerful and the staff welcoming. 10:00 PM: It’s time to wend your way home and go to bed - though I’ll understand if you want to stay later. 6:00 AM: If you can drag yourself out of bed at this early hour you are in for a treat. 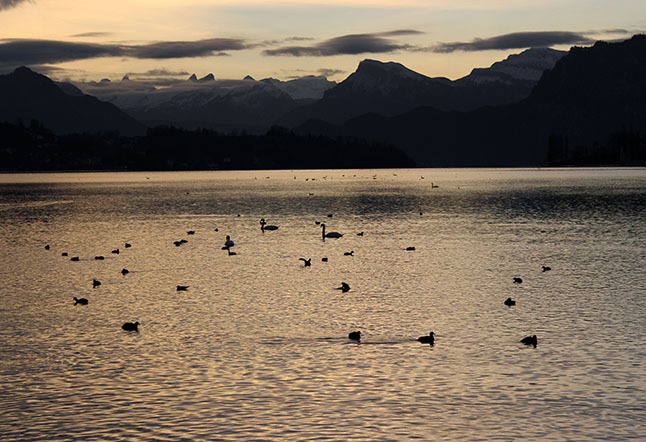 The sunrise over Lake Lucerne is worth the early start and the trek back down to the foreshore. 8:00 AM: After your early start it’s time for breakfast. The hotel does have a really good breakfast (and it’s normally included in the price). Or you can go on an adventure to one of the cafes in the area. 10:00 AM: Today is all about the Old Town of Lucerne. If you’re lucky there will be some Christmas markets up and running where you can get some delicious treats from Switzerland and all over the world. The old town is incredibly stunning, and it is lovely to wander around (and across the famous bridge of course). 12:00 PM: When we visited last time we had an amazing lunch in a traditional Swiss restaurant. The waiter was incredibly friendly and funny, and the rosti was delicious (and enormous). I wish I could tell you the name of this lovely place, but after an embarrassing amount of searching on Google Maps I cannot remember the name. If someone wants to fly me to Lucerne so I can work it out I am happy to do so. Otherwise all I can say is take advantage of Trip Advisor and find a good Swiss restaurant to visit. If you’re going to Switzerland you should take advantage of the awesome (if very filling) food. 3:00 PM - Assuming you can still move after your lunch it’s time to take another walk along the lake before heading back to the hotel. If you can tolerate the thought of food there is a lovely chocolate store across the road from the hotel called Bachmann. It also does coffee and hot chocolate and is a great place to end your trip to Lucerne. In 2012 on our first trip to Switzerland we only stayed three days because the people we had spoken to who had been to Switzerland weren't particularly over the moon about it. When we got there though we knew had to go back - it was the most beautiful place we had ever been and we fell completely in love with it. Lucerne is probably the most beautiful and peaceful place I will ever visit. The best way to see Lucerne is get out and go for a walk. It has a beautiful old town on the lake and if you're lucky enough to come in winter there are Christmas markets full of delicious Swiss food. Mike and I ate here both nights and had a great time. It's not exactly haute cuisine, but the beer was great, the music was good and the food tasty. The atmosphere is really what makes this place possibly helped by the fact we made friends with an Australian barman; Daniel. He made us feel so welcome. If you aren't sure what to drink I recommend Feldschloschsen beer. It's really refreshing and I know this sounds like a trick but I swear my husband and I drank about 1.5 litres each and woke up at 6:00 am the next morning to catch a train with no hangover. Hotel de la Paix is a little bit back from the main tourist area of Lucerne. We managed to score a room with a balcony that looked out over the mountains. One of the balcony doors was in the bathroom, and I had two glorious baths listening to Serial and looking out the window. Utter bliss. Breakfast is included and was a great mix of hot and cold options. Interlaken is known as a bit of a jumping off point for many of the adventures you can have in the Swiss Alps - and that's why we were there as well. 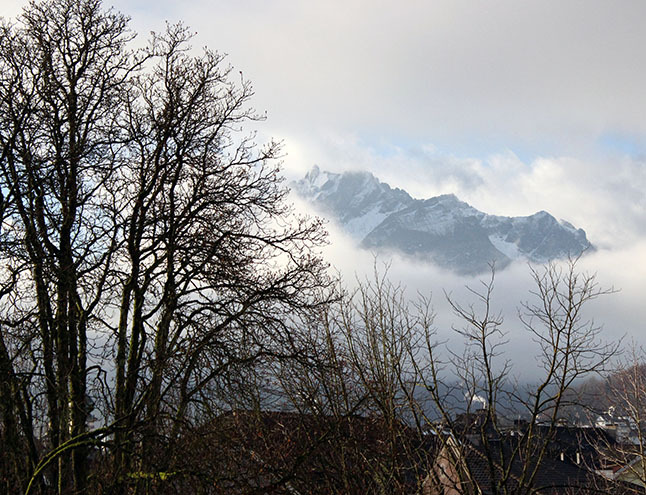 We had one aim with our trip to Interlaken - see snow. It may sound strange to some of you, but for Australians snow is an exciting and rare experience. Because this was our aim I can't really tell you what to do in Interlaken. I can however tell you about the adventure we had when we went on up the Schilthorn. 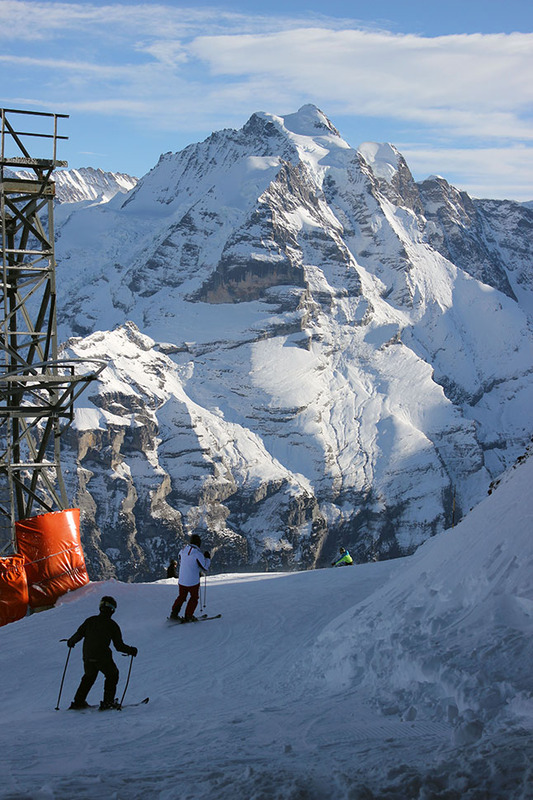 Our choice of the Schilthorn (also known as Piz Gloria) is all thanks to the manager of the hotel we were staying at. She suggested it to us and talked us through getting up the mountain. It isn't cheap by any stretch of the imagination but I can honestly say it is worth the price. It was quite the adventure to get there - we took a train, then a bus, then a cable car (which almost gave me a heart attack). When we got to the top - words and pictures cannot describe how breath taking it was. We had lunch at the revolving restaurant (so kitsch but so awesome at the same time) and then went down to the ski ramp to play in the snow. It was a spectacular day, one I won't forget for a long time. Hotel B & B Alphorn was such a sweet little place. It almost felt like a hostel in many ways; small and quaint but really cozy. It's a bit out of town, but not so far that it feels cut off. The highlight (aside from the coffee and helpful service) was the shower that had LED lights built in which changed colours as you showered. Such an unexpected feature but actually really cool.